I visited Kandholhu Cruise and Spa Island (Kandholhudhoo – N. Ari) for 4 nights in Aug. 2011. My comparisons are somewhat limited: Freeport, Bahamas 1970s; Florida’s Middle-East Coast 1980s; Kurumba, Maldives 1996; Half Moon Bay, Saudi Arabia 1997; Oahu, 1999; and Jeddah, Saudi Arabia 2000. I am an occasional, but avid snorkeler, and even less frequent diver. My comments are more a reflection on the quality of snorkeling in the Maldives as much as anything else. I took my cue to visit Kandholhu directly from this blog. Thanks for all your hard work Bruce! Tiny, small, and medium fish were in abundance. There were also medium-large ones here and there, around 5 to 8lbs, in several body shapes and species. 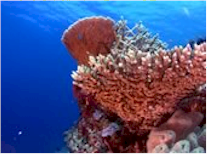 The reef was excellent, varied, and the vast majority of it was live coral. 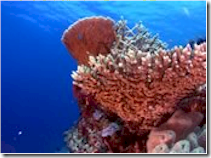 There were relatively few signs of coral stress. There is some broken coral in a few areas, but generally those are minimal. There is more variety of coral types here than in any place I've had the good fortune to see, and the ratio of live coral to dead is the best I've seen. 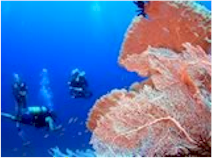 There are extensive table corals, and a variety of stag-horn type corals, mixed in with cabbage shaped corals, brain corals, and soft corals. There were occasionally a few stripes of damage, up to a few inches wide and up to 2 feet long, of apparently heat-caused coral bleaching that is scattered here and there. It is rare enough and hopefully seems to be on the wane. 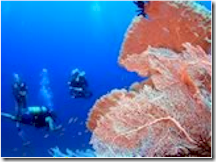 Compared to my 1996 visit to Kurumba, another Maldivian resort, the corals do not seem as brightly colored. I suspect that this could be a heat-related Maldives-wide phenomenon (as was widely reported), but it would be hard to be sure. The variety of small and medium jacks, trevally, grouper, snapper, sweetlips, wrass, puffer, porcupine, stone, needle, trigger, parrot, clown, pompano, damsel, ballyhoo, mullet, runner, 'minnow' and other fish-types was also the best I've seen. I didn't see every type of fish that could be seen, obviously, but this was by far the most variety in any one location. Just as a few examples, I saw more variety of groupers, snappers, and triggerfish than I've ever seen previously. A memorable first was seeing tuna cruising along the perimeter of the reef. Another first was watching larger fish corner a school of bait fish and attack it, thanks to some eager neon-trimmed blue-fin jacks that were having a mid-morning meal. Second up were the baby black-tip reef sharks. They could be seen in abundance, both above and below the water, at the secondary jetty, and less often in other areas of the reef. They were hardly bigger than hefty mullet, and topped out at about 2 feet, although they'll get much bigger… eventually. The quantity of sharks that I spotted at Kandholhu easily surpassed my previous experience at Kurumba where I saw less than a dozen (pity me) during 6 days of snorkeling in October 1996. On this year’s trip (Aug, 2011) to Kandholhu, I easily spotted a dozen or more sharks each day and the regularity of sightings was phenomenal. The longest dry-spell at Kandholhu was a half hour. Also, the sharks seemed less skittish at Kandholhu. On many occasions sharks that might otherwise be wary just accepted me as part of the 'furniture' and did some wandering circuits as if I was just an overgrown turtle out for a lazy swim. I learned to keep my arms tucked in to not scare them and I was lucky enough on several occasions to have them continue on their flight path unperturbed. They sometimes passed within arms-reach of me and a two foot distance was occasionally achieved. The secret seemed to be: do nothing and just enjoy! Although I looked for them at Kandholhu, I didn’t see any of the 5 to 7 foot gray reef sharks that I had previously seen on my 1996 trip to Kurumba, and whose continued presence in 2011 is confirmed by MaldivesComplete. It seems the gray reef shark is only occasionally seen at Kandholhu. Speaking of turtles, I'd never seen a turtle in the wild. This trip would sort that out. I saw at least two turtles on each outing and a maximum of three, for an average of about 5 sightings a day. I managed to get the turtles identified by spots, splotches, splashes, and squiggles in their markings and colorings. I was able to identify that there were at least 4 individuals and possibly a few more. I saw turtles swimming, surfacing to take air, and eating. Apparently anemones are their favorite food and they were often industriously seeking these out, using their extendable necks to get into crevices to find them. Then they were cutting them up into small bite sized pieces with their bills, before finally swallowing them. I guess that’s one way to make a living. I think these are called Imbricated Turtles and they appeared to be similar in size and coloring to Hawksbill Turtles in the Atlantic. I also saw some rays on this trip. I was walking the main jetty and saw a medium sized Black Stingray in the lagoon, but never encountered one underwater. I also saw a full-sized eagle ray twice while snorkeling. Both were good sightings and the second did a classic, serene, offshore fly-by. The first sighting, however, was particularly interesting. The eagle ray approached from the front, only slightly below. It swam nearly head-on at me in a shallow angled ascent while flapping its wings. It continued until it was about five feet in front of me then initiated a slight banking adjustment turn to barely accommodate my position and narrowly miss me. It slowly flapped by me, barely two feet away, revealing its mouth, gills, and underside. Absolute magic. A full circumnavigation of the small island revealed some brown (Giant?) morays that came out and swam along under me. Night snorkeling revealed much of the same as day, along with sleeping fish, a sleeping turtle wedged in a crevice, lobsters, reef squid, and certain colorful coral polyps and tube feathers that came out to play and feed. The waters have bio-luminescent miniatures in them which light up and are clearly visible as green glowing specks when you turn off your lights and move your arms around. Access to everything was super easy and life at the resort was very, very comfortable. Weather was perfect: no rain, few clouds, and reasonable humidity. Cons were very few. I missed the resident dolphins and a visiting lemon shark. Plankton was high, so I may have missed some things that I would have otherwise seen. A few larger sharks up to six foot or so would have been welcome. A very large grouper, napolean, manta, or whale shark would be equally so. But, the sheer quantity and variety was fantastic, and I liked the island for size, location, safety, and slow current.